Brie, a semisoft French cheese, can be served chilled, at room temperature or baked. How long Brie is edible past the sell date depends on where the cheese was purchased, how it was made and how it was stored. To prevent foodborne illnesses, it's good to know the signs of spoiled cheese. 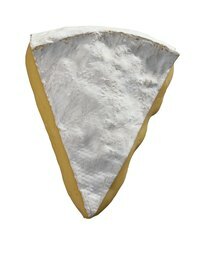 A little mold can often be cut away from hard cheeses, but this is a risky move with semisoft cheeses such as Brie. The "queen of the cheeses," as Brie is sometimes called, is made differently for sale in France from when it's made for export to other countries. In France, Brie is traditionally unstabilized and made with raw milk. Though raw-milk cheeses are sold in the United States, the government requires them to be aged at least 60 days. The aging process for making Brie is usually about half that long. Both raw-milk Brie that is cut too early and Brie that is stabilized never fully matures. Some people eat Brie made with raw milk when it becomes hard and brown, up to a year past the sell date, but it's safer to consume the cheese when it's fresh. In the United States, people are used to seeing Brie that is white on the outside with a slightly firm but creamy interior. As the cheese ages, the interior softens and the outside becomes harder and turns slightly brown. If the Brie is left to continue aging, the edges of the interior begin to get runny. At this point, you will probably notice an ammonia smell. The cheese is still edible at this time, but some people dislike the stronger, more pungent flavor. Most cheeses, even semisoft cheese, can be eaten a week or two past the sell date, but it's important to eat them responsibly. Brie has a rind that contains an edible mold. You might find that the rind is flavorful. This white mold that blooms on Brie is safe to eat. If you see green mold on your Brie, however, don't hesitate to throw the cheese away. Green fuzz on the normally white rind or any discoloration inside the Brie cheese is cause for alarm and a good reason to get rid of the cheese, regardless of the printed sell date. Good storage habits help extend the shelf life of Brie. Before the cheese is cut, it's fine to wrap it loosely in waxed paper. However, if the cheese is not wrapped properly once it's cut, it can dehydrate and become hard. In certain environments, moisture, bacteria or other unwanted impurities can contaminate unwrapped Brie. Proper storage of Brie cheese includes making sure that you don't keep the cheese on the counter for longer than an hour or two at a time and that you put it back in a refrigerator set at 40 degrees Fahrenheit or less after wrapping the cheese or putting it in an airtight container.